Hi Folks! Kelly here. Having two boys, I'm always in need of tween/teen boy birthday cards. CAS-ual Fridays has the best stamps for these creatures. One set that works well is the Whole Shebang with a giant HB2U as the focal point. 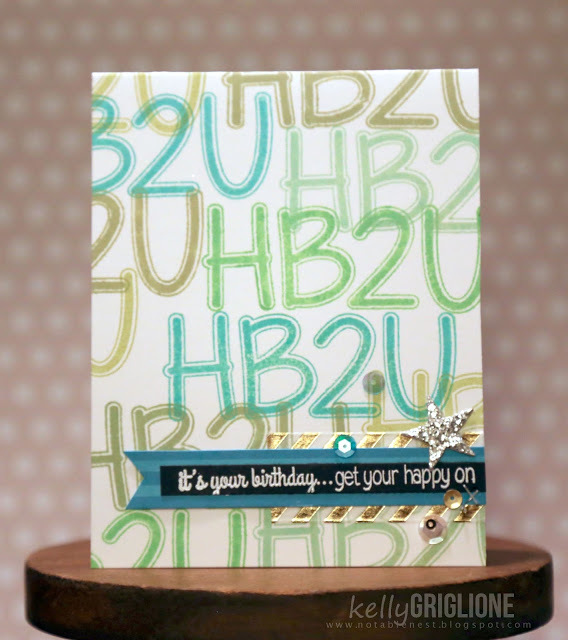 I stamped the HB2U in different shades of Hero Arts green ink. 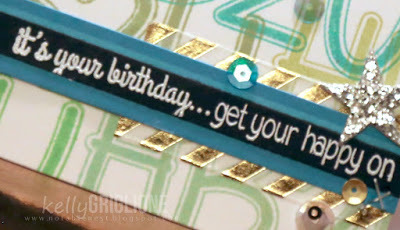 The darker turquoise HB2U is stamped first, right above where I wanted to add the secondary sentiment. All the other HB2Us bleed off one of the edges of the card, some overlapping and some not. I like that this stamp is so large, it doesn't take much to fill the entire card base. from the Stars Fri-Die. Not too frilly for a teen boy card, but something a little fun just the same. Love ideas for more masculine cards. I like it. Right to the point, just what guys like! This card is so awesome! I love that background!